Georgia Sports Blog: Where would Georgia be ranked? 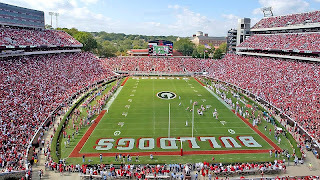 Where would Georgia be ranked? If it was 2009 and Joe Cox had appendicitis, Caleb King or Richard Samuel was out with a viral infection and had lost a bunch of weight, Ben Jones and Bean Anderson were out, and you had no viable back up to start camp at QB or RB? Oh, and you'd gotten shower sexed by a Big East team in the Sugar Bowl seven months ago? Very few teams but Florida would be ranked tenth. That is for sure. Yet, that is what Florida is facing. Driskel is out for at least half of camp with appendicitis. Presumptive starting RB Matt Jones is out after eating a bad cheeseburger. Two presumptive starting linemen have injuries that will hold them out indefinitely. We all know LOVED what happened to Florida in the Sugar Bowl. That is what brand recognition will do for you. Quality troll. I like it. Funny, I thought A&M was the SEC team most likely to finish below where the started. Gonna have to revisit that. Florida has the ability to put together a decent or very good season. They got by too much last year on breaks and such. Just stunning they have the second fewest returning starters in he conference and the injuries, ect., yet they are ranked 10th in the nation. They need to enjoy the preseason #10. It will be the only time they are that high in the polls all season. I think this is a mercy vote. The Gaytors will be out of the top 25 by the third week, never to be heard from again.